Does a longer duration of CPR in paediatric cardiac arrest have prognostic bearing on the likelihood of a positive ultimate outcome (i.e. survival to discharge with intact neurological function)? Primary Outcome: survival to hospital discharge. Secondary outcomes included survival with favourable neurological outcome. Population: patients <18 years of age suffering pulseless cardiac arrest in-hospital at one of 28 US and Canadian institutions between 1st Jan 2000 and 31st Dec 2009. Results: 3419 paediatric in-hospital cardiac arrests fulfilled the criteria. 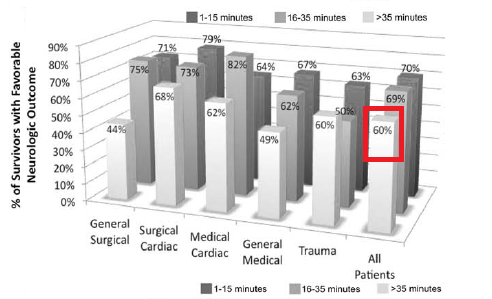 Median (IQR) CPR duration was 10 minutes (4-25) for survivors and 25 minutes (12-45) for non-survivors. Survival to discharge was 27.9%; 19.0% of all cardiac arrest patients had a favourable outcome, representing 68.2% of the survivors of the initial insult. Survival rate and favourable neurological outcome fell linearly in the first 15 minutes; neurological outcome decreased by 1.2% for each additional minute of chest compressions. favorable neurological outcome even after prolonged CPR. Why was the study necessary? This article was brought to my attention via twitter with the headline “among survivors favourable neurological outcome occurred in 60% undergoing CPR > 35 minutes”. On checking this was indeed word perfect from the abstract. This took me aback as this was not quite my experience, even with the non-survivor group excluded. A paper definitely worth a closer look then! The article starts with the pretext of the (relatively) low cardiac arrest rate (0.7-3%) in children admitted to hospital with a note that, although still low, survival rates have improved in the last decade. The authors acknowledge a paediatric mantra that CPR beyond 20 minutes or 2 rounds of adrenaline is generally futile although it is interesting the evidence for this has never been robustly demonstrated. A large prospective cohort study then seems a very reasonable undertaking. The American Heart Associations “Get with the Guidelines-Resucitation” [AHA GWTG-R ]initiative providing a national registry for the relationship between in-hospital CPR duration and intact survival to be explored. Patients must have had > 1min of CPR provided and it is worth noting that as well as inpatients those in outpatient clinics were included. Those in whom the event started out of the hospital were excluded. Anyone receiving >180 mins of CPR were defined as having 180mins maximum. The primary outcome measure was survival to hospital discharge and secondary measures included return of spontaneous circulation > 20 mins, 24 hour survival and discharge with favourable neurological outcome – this was defined as a Paediatric Cerebral Performance Category of 1, 2 or 3 on discharge. The PCPC is shown in table one. The authors are open about the fact that as a multi-centre study classifications between hospitals may differ. They are even frank enough to state that as the users of the AHA-GWTG-R pay a fee to do so they may be more interested in outcomes that other hospitals (the AHA-GWTG-R is used by 10% of hospitals). It could be argued that included ED patients with in hospital arrests are very different from patients who arrest on the wards but the differences between these two groups were not broken down. This would have been very useful information for the emergency care community. The data collected included 5922 which were all accounted for in an Utstien diagram (figure 1). Key demographic details in the study were that the mean age was 4.9+/- 6 years, 8% of events were not witnessed but nearly all (90.5%) were monitored. The majority of patients were General Medical (43.2%). The median CPR duration was 10 minutes for survivors and 25 minutes for non-survivors. Survival to discharge was 27.9%, but only 19.0% of all cardiac arrest patients had a favourable outcome as per the PCPC. Both survival rate and favourable neurological outcome fell linearly in the first 15 minutes, with neurological outcome decreasing by 1.2% for each additional minute of chest compressions. However although only 19% had a favourable neurological outcome this represented 68.2% of the survivors of the initial insult. The study confirms that generally the outcome after arrest is poor however it demonstrated there is variation in the outcome dependant on the type of patient. Interestingly there was an indication that continuing CPR for more than 20 minutes may be justified given the proportion of those who survived with a positive neurological outcome, using the PCPC classification system. It is important to note that overall surviving numbers were low and there was not a priori attempt to predict in which patient group prolonged CPR may be beneficial. The biggest challenge with this study is the use of the PCPC and the classification of 3 as a favourable outcome. 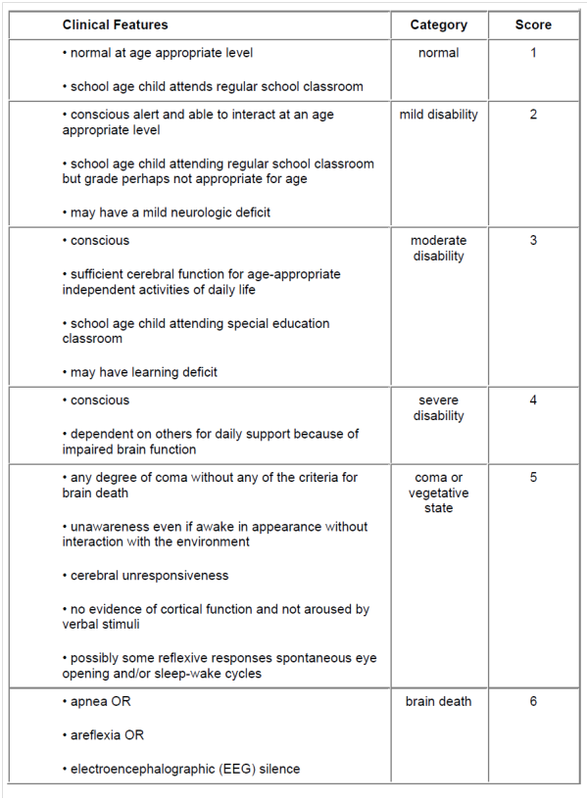 Classification 3 is a moderate disability but is quite different from 4 (severe; dependant on others for daily support). The distinction is not always clear cut and an excess of grade 3 due to the strict classification may bias the results especially as this was done on discharge when a more favourable grade may be applied. Finally although the break down into 0-15, 15-35 and >35 seems reasonable there were patients receiving up to and above of 180 minutes of resuscitation. It would be useful to distinguish resuscitation rates into standard, prolonged, very prolonged and unique for the purposes of evaluation as the patient groups, and potentially teams working on them are likely to be very different. This study is the largest of its kind and is an extremely useful platform on which to base further research. It will be important the neurological outcome is clearly defined and followed up for a reasonable period of time. The distinction between medical groups needs to be taken into account and for the emergency care community it is validation of the extremely poor survival and outcome of traumatic cardiac arrest. Until further work is performed it will be difficult to extend the ’20 minute rule’ but it is vital this work is performed. To be working in an area as ethically challenging as resuscitation needs a clear evidence base and work both in and out of hospital. Do rates differ between ward patients and those suffering cardiorespiratory arrest within the Emergency Department? How would results change if we defined “favourable neurological outcome” more clearly? This entry was posted in Critical Appraisal on February 9, 2013 by PEMLit.